You run an ecommerce store and because of this, you’re constantly looking for new ways to generate more revenue. That’s kinda how business works. But you’d be crazy to assume that the only way to do that is by making more sales! In this post, I’m going to share one of the easiest ways to grow your bottom line and exactly how you can do it. Of course, more sales will do the job. No one’s denying that. But it’s probably one of the most challenging ways to grow revenue. So, what are some of the ways we can grow our revenue? Numbers 1 and 2 essentially equate to ‘more sales’, so how can we leverage number 3? Increasing the amount of money that each customer spends with you is a fantastic way to generate more revenue and it can often be much easier to do than growing sales. How do I calculate Average Order Value (AOV)? How do I increase AOV? Won’t free shipping damage my profit margins? 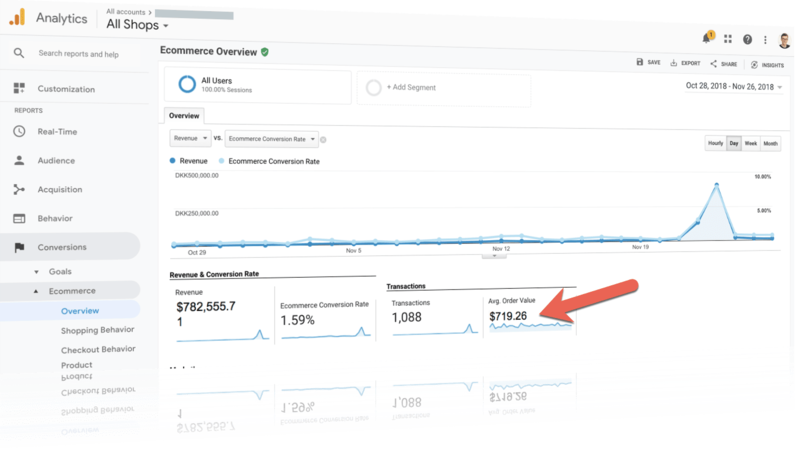 AOV is one of the most important metrics for your ecommerce business and you absolutely need to be keeping a close eye on it. How do you calculate AOV? The equation is simple, and you don’t need complicated analytics tools to work it out. Just divide your total revenue for a given period by the number of orders in that same timeframe. A 30 day period is probably best to start with. That way you can track monthly progression. Using ecommerce tracking on Google Analytics? If you have this set up properly then you can also get your AOV from within GA.
Log in and head to Conversions > Commerce > Overview and you’ll be able to find it there. Remember to set the time period in the top right of the screen. There are many ways to increase AOV and the great thing about it is that all of them are pretty simple to do. It all comes down to the way you structure your website and the user experience it creates. Usually, just a few tweaks to your website can make a massive difference to your AOV. Think your AOV is already pretty good? There really is no limit with how high you can go with your AOV so don’t be foolish and become complacent. It’s a constant game of testing and tweaking. BUT, the good news for you is: I’m going to tell you how you can improve your AOV today, almost instantly. The amazing thing about all of these ideas is that there’s usually some app or plugin that someone’s developed to help you get it set up in less than 5 minutes. And that means that by the end of the day – today – YOU COULD BE MAKING LOADS MORE MONEY! But if you had to ask me which of these is my favourite… I’d pick free shipping every time. Let’s take a moment to go through this. Cause it sounds kinda counter-intuitive right? … Giving something for free to make more money. Bear with me for the next 30 seconds and everything will make a lot more sense. 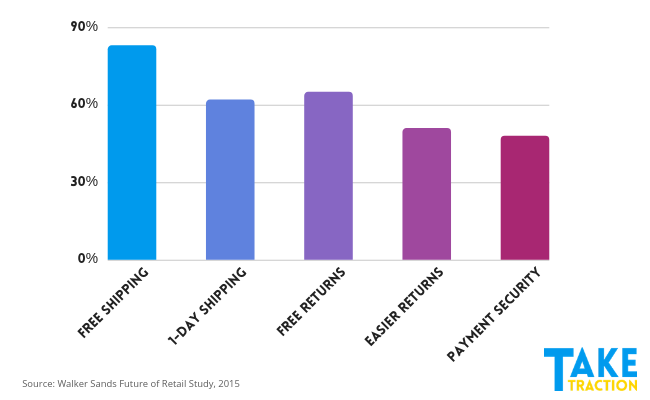 Do your customers like spending money on shipping? What would your customers rather spend their money on, products that they love or shipping? I think the answers are clear. Therefore, this means we can use free shipping as an incentive for people to spend more money on our products. In fact, according to a 2015 study by Walker Sands, 83% of people surveyed said that free shipping would make them more likely to shop online. Let’s imagine you’ve got an ecommerce store that has an AOV of $60 over the past 30 days. 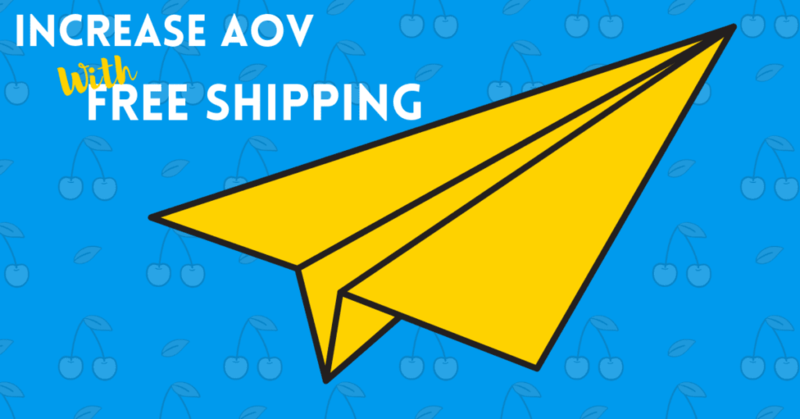 If we create a free shipping offer on our website, with a threshold that’s roughly 20% higher than the current AOV, people are going to start increasing their order size just to get the free shipping. Let’s say we set our free shipping threshold to $75. Now, people who have roughly $60 in their shopping cart are going to want to try and increase their order so that they can qualify for free shipping. Granted, not everyone will do it. But some people will! And that will bring your average order value up, in turn generating more revenue for your business! While this strategy will increase your average order value, the free shipping offer will ultimately cut into your profit margins a little bit. For some people, this may be okay. Realistically you should be making more profit overall, even if your margins are slightly lower. BUT! Let’s say you’re now making an extra 10 bucks per order on average with a 40% margin. That means you’re making an extra $4 profit but that profit is instantly eaten up by the $4 shipping YOU had to pay for. So, it’s important to really calculate your margins and shipping costs to make sure that you know just how much higher you need to set your free shipping threshold. In this scenario, you could just add $1 to the price of each of your t-shirts. That way 3 shirts would add up to $63, allowing the customer to get free shipping but they’ve actually paid the exact amount of the shipping through the price increase of the product. But it gets a little more complicated when you have a range of prices for products in your store. The best way to do this is to take your average shipping cost and divide it by your free shipping threshold. Times this number by the price of your product and the resulting number is how much you need to add to the price of that particular product. This will mean that you’ll be increasing your AOV for people who only buy one or two items and don’t meet the free shipping threshold AND you’ll be covering your shipping expenses when you give free shipping as well! The first thing you’re going to want to do is to look at how to set up the free shipping offer on the backend. I.e. How do you make your shipping rate automatically set itself to free when someone checks out for an amount over your decided free shipping threshold? This is usually pretty easy to do and can be set up from the backend of whichever ecommerce platform you are using. So, get in there and get that set up! Just remember to pick a free shipping threshold 20-30% higher than your current AOV. Now that we’ve got our free shipping offer set up, we’re going to want to advertise it in as many places as we can. You can probably recall having seen this on a bunch of ecommerce websites before. The fact is, when people land on your website they are instantly comparing your brand to all of the other brands they could buy similar products from. Whether it’s that they’ve got other tabs open and they’re comparing side by side or the simple fact that they know they can always get free shipping on Amazon, people are looking out for you to prove to them why they should shop with you. That’s why it’s a great idea to have some kind of banner advertising your free shipping offer on the homepage so that people instantly know about it. In fact, you could even make it part of the bottom of your header so that it shows up on every page on your website. In the image above you can see that Holland & Barrett have decided to use this horizontal space on their homepage to show off all of their shipping offers, highlighting the benefits of shopping with them. This will probably be the only shipping offer you have, so why not try throwing in a satisfaction guarantee and a free returns policy to make the most of the horizontal space up there? This is another great way to advertise your free shipping offer. In fact, if done correctly, I think it’s by far the best. Yet strangely you don’t see many people doing it! Most themes will allow you to add a bar above the header that you can fill with a sentence or two, and maybe even a button. This alone is a great way to advertise your new shipping offer. It’s usually super easy to set up and it’s a great way to make sure it’s advertised on every page of your website. If you can’t find an easy way to do this with your theme alone, you can always use a free tool like Hello Bar to get the job done. This will be a good start. BUT. There IS a way to make this 10 x more effective. 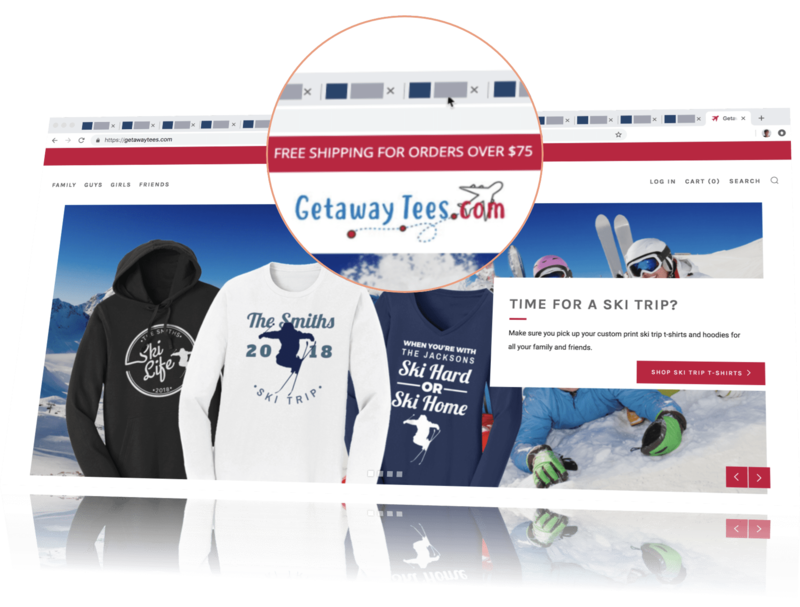 Some plugins/apps will allow you to create a bar that displays every time someone adds something to their shopping cart, telling them how much more they need to add to qualify for free shipping. Check out the image below to see the three different messages that will pop up. The first one shows before anything is added to the cart. The second one shows when someone adds something to the cart. And finally, the third one shows once they’ve reached the free shipping threshold. This has worked incredibly well in the past for me. It’s one of those 80/20 moments. Do this one thing and you’ll already be outperforming the competition, as well as your old self. Here’s a fantastic plugin from Hextom for Shopify. Here’s a plugin (haven’t tested myself) you can try for Woocommerce. There doesn’t seem to be a similar plugin for Bigcommerce but let me know in the comments if you find one. Now that you’ve set up your new free shipping offer, you might as well spread the word to get some extra sales. After all, paying shipping may have been a deterrent for previous customers who want to buy more products from you, especially if they know that they can buy similar products from Amazon with free shipping. Let them know about your new offer and you’ll likely see some spontaneous purchases coming through the door. Don’t you just love paying shipping fees? That’s why we’ve decided to add free shipping to our store! Now, we can’t give free shipping on absolutely everything because… well, we’d probably go broke. But from now on, all orders above $75 will automatically receive free shipping! We really do appreciate your business and we want to make sure that shopping with [Your Brand Name] is always a great experience. Thank you for your support. Now that we’ve informed our existing customers – who, by the way, are our greatest asset – of our new free shipping offer, it would be rude not to give them some product suggestions, wouldn’t it? After all, we want to make it easy for them. Make sure to include some products at the end of this email to get customers in the buying mood. By this point, you’ve got an email ready to go out. Okay, I know you haven’t, but you will once you stop reading this and start following all the steps in this article. But why stop with email! It’s pretty difficult to get noticed amongst a sea of 100+ daily emails that people receive so we want to make sure we get the message in front of a customer through as many different channels as possible. Why not send out a broadcast to your Facebook Messenger audience as well? Check out this article for some great tips on how to build your audience on Facebook Messenger. Publish your new free shipping offer on your social media pages. People followed you to find out about deals like this in the first place so it would be rude not to let them know! Run banner ads. If you’re using Klaviyo you can sync your Existing Customers list with Facebook Audiences and run an ad to let them know about the free shipping offer. This will give you much more reach than you’ll get by just publishing it on social media. If you’ve got all of your pixels set up correctly, don’t forget to try the Google Display Network, Pinterest, LinkedIn, Twitter and Youtube as well! Another great way to advertise your new free shipping offer is through cover images on your social media profiles. Let’s face it. Most brands don’t make good use of their cover images. It’s an afterthought. Maybe you just pulled an image from a campaign or a banner on your website and used that for your cover image. You know if I’m talking to you. Now’s the time to start making the most of that precious real estate. Use visual cues to direct people’s eyes to the CTA button below the cover image… if in doubt a non-discrete arrow will do the job. Just make sure it looks good on both mobile and desktop. Time to go and get started with your own free shipping campaign! Get out there and let me know how you get on. What other ways have you managed to increase AOV in your store?